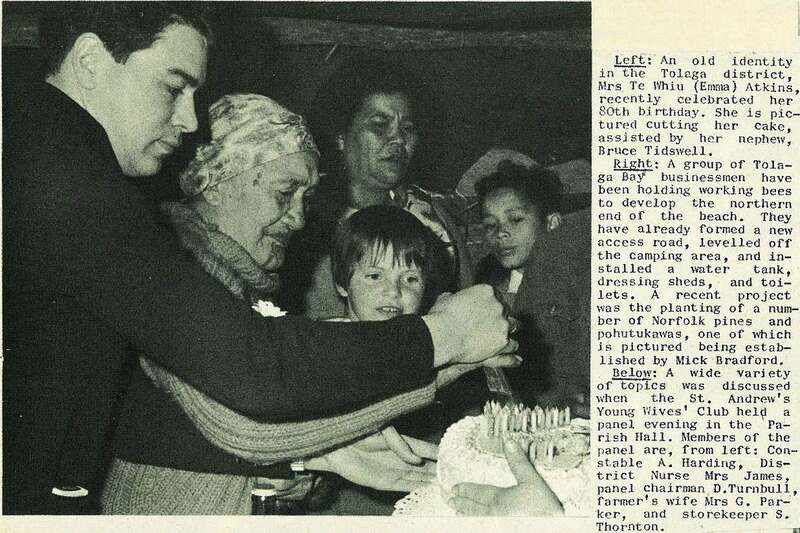 An old identity in the Tolaga district, Mrs Te Whiu (Emma) Atkins, recently celebrated her 80th birthday. She is pictured cutting her cake, assisted by her nephew, Bruce Tidswell. A group of Tolaga Bay businessmen have been holding working bees to develop the northern end of the beach. They have already formed a new access road, levelled off the camping area, and installed a water tank, dressing sheds, and toilets. A recent project was the planting of a number of Norfolk pines and pohutukawas, one of which is pictured being established by Mick Bradford. A wide variety of topics was discussed when the St. Andrew's Young Wives' Club held a panel evening in the Parish Hall. Members of the panel are, from left: Constable A. Harding, District Nurse Mrs James, panel chairman D. Turnbull, farmer's wife Mrs G. Parker, and storekeeper S. Thornton.